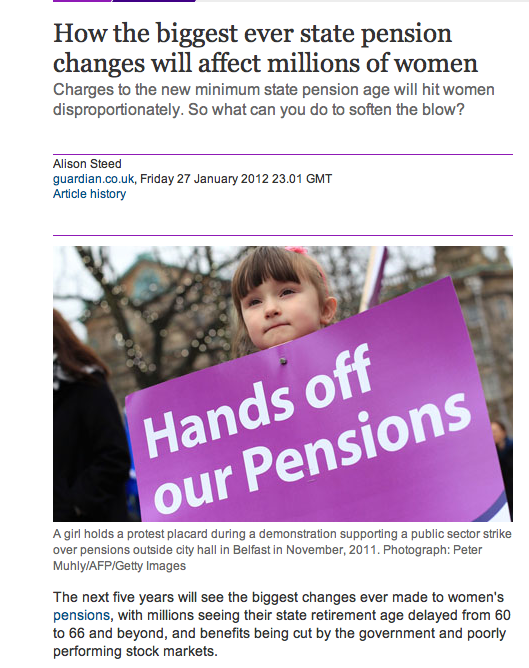 According to figures from Prudential less than a third of women expect to be financially comfortable in retirement. And many of those women might be overly optimistic. This year the average expected retirement income is £15,500. That's averaged across both genders and so for women it's likely to be considerably lower. And the trend is downwards. If this bothers you or affects you then use the government's state pension calculator to work out what you'll be entitled to at retirement. Then have a read of our chapter called 'Know Tomorrow Comes' in Sheconomics, in which we demystify the pension minefield. Then I urge you to have a look at this Guardian article - because there are steps you can take to improve your prospects. But you have to act now. Yes now. Go on, do it. Is luxury just a beautiful experience - or more than that? Do you agree? I think he’s only partly right. Because experiences, however beautiful, are also often fleeting, transient, gone in an instant. 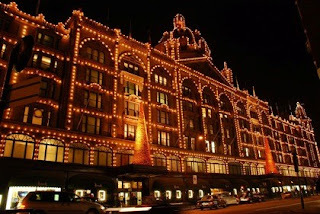 Real luxury, I would argue, is about anticipating the most beautiful experience. That’s because brain research now tells us that pleasure isn’t just experiential. It’s anticipatory. We know our brains have pleasure detectors. When we acquire an object of desire, or see a lover’s smile or taste a wonderful champagne, a rush of happy chemicals go sloshing through the brain. But those happy chemicals also get released when we anticipate something we love. In fact we get a bigger rush from anticipating than we do from experiencing. Scientists from the University Medical Centre in Hamburg recently conducted tests that measure brain activity and found that our brains experience more pleasure when we are working towards something than when we actually achieve it. That’s why luxury in the form of real quality brings lasting satisfaction, it’s why craftsmanship persists and why bling will only ever bring transient satisfaction, to the producer and to the consumer. Science has proved that it’s anticipation that makes us happy, that long-termism always trumps short-termism and that a delayed reward brings more pleasure than an instant reward. Interestingly the scientists found also discovered that regular hints about the upcoming reward can boost our feelings of pleasure, when people in the lab were reminded of something that was worth waiting for the pleasure centres in their brains lit up. So if you have a special bottle of GH Mumm champagne tucked away for a special occasion, having a quick peek at it on regular occasions will be sure to boost your happiness levels. Dreaming about future pleasures can bring more happiness than experiencing them. Think about holidays too. We’re all supposed to love holidays. Do you like planning a holiday, looking at images of tropical beaches, beautiful sunsets, sumptuous hotels, imagining a place where the sun always shines and you’ve left all your worries behind in Heathrow’s departure lounge? Well researchers in the Netherlands recently showed that we get a larger boost in happiness from planning a holiday than we do from the holiday itself. They studied the happiness levels of over 1000 Dutch adults and found that happiness levels were highest when people were planning their holiday. In fact they argue that if you really want holidays to make you happier you shouldn’t just have one long one, you should have lots of shorter ones so you maximise the time spent in anticipation. Intuitively we all know this and evolutionary psychology accounts for why we’re drawn to products that embody this waiting process, that stand for timelessless and are characterised by tradition and craftsmanship. Ironically though nowadays we are rarely encouraged to wait. We live in an immediate gratification society, instant messaging, fast food, ready credit and computer games where you can kill your enemies at the touch of a button. Are we all going to lose the ability to delay our pleasures? During boom times that is always a risk but during a recession different types of processes operate. That’s when delayed gratification comes to the fore. Because psychological research shows being able to delay gratification is a sign of higher cognitive ability, one that’s more recently evolved. A sign of maturity that’s even linked to quality of life. Resisting temptation is hard if you like immediate gratification. 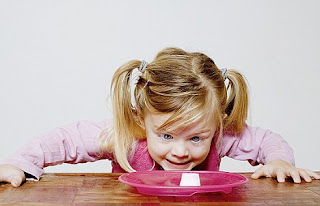 You may have heard of the famous marshmallow test that an American psychologist called Walter Mischel carried out on children in the 1960’s. Mischel offered young children, around 3 and 4 years of age, a marshmallow. He put it in front of them and said they could eat it now OR if they could wait while he stepped out for a few minutes when he came back they could have two marshmallows. Most children couldn’t wait. They either ate it as soon as he was out of the room or sat and squirmed for a while and then caved in and ate it. Some covered their eyes with their hands or turned their back on the marshmallow so that they can’t see it. One girl stroked the marshmallow lovingly; another boy looked carefully around the room to make sure that nobody could see him then picked it up sucked it and put it back! Some children managed to wait 15 minutes. But about 30% of the children wrestled with temptation but stuck it out for a full fifteen minutes. They were ones who could delay gratification in return for a second marshmallow. Years later the experimenters followed up the children to adulthood. The ones who could wait did better at school, were more successful in their careers and in their relationships. The instant gratifiers, the ones who couldn’t wait, on the other hand were more likely to have behavioural problems at school, or problems at home. The moral of this story is that waiting is a higher-cognitive skill, a sign of maturity and those who can delay gratification have a better quality of life. 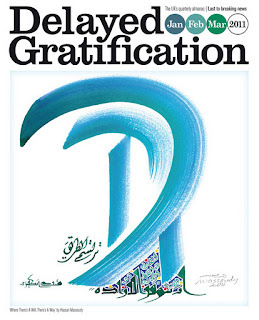 Delayed and immediate gratification originate in different parts of the human brain. More recently brain researchers have found the key to the link between delayed gratification and intelligence. 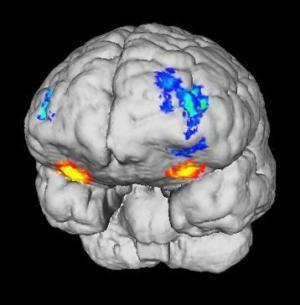 Different parts of the brain get activated by immediate and delayed rewards. The need for immediate reward is driven by the more primitive part of the brain – the part that might impel the purchaser towards quick fixes, impulse buys, bling and disposable luxury. But when people choose longer term options they use the frontal-parietal part of the brain, that is situated in the more recently evolved pre-frontal cortex - the part that differentiates us from animals and from our ancestors – it gives us the ability to reason, to plan ahead and exercise self-control. So delayed gratification and the ethic of the craftsman overlap and reinforce each other in that both require a certain construction of the future, a certain ideal of stability and longevity. That’s why brands that are associated with longevity, with craftsmanship and tradition, will continue to have lasting appeal whatever the economic climate but especially when people want every penny they spend to have value. So Michael Ward was only partly right when he said that luxury is having a beautiful experience, it’s more than that. The best things come to those who anticipate…. This is the talk I gave to the G.H. Mumm Perrier-Jouet Champagne Assembly on 27th January. Polly tweeted that the evening was ‘mental’. Rose said it was ‘high energy’. Andy gave his book to a stranger he got chatting to on the train. Charlotte travelled all the way to Richmond wearing a badge that said Harlot. 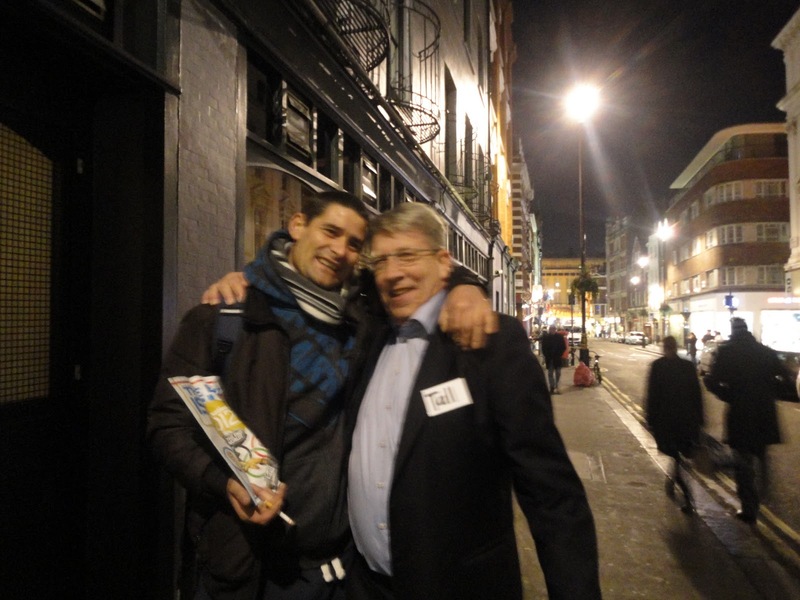 Mike said "I've just had the most interesting 45 minutes I've had with a stranger for a long time!" 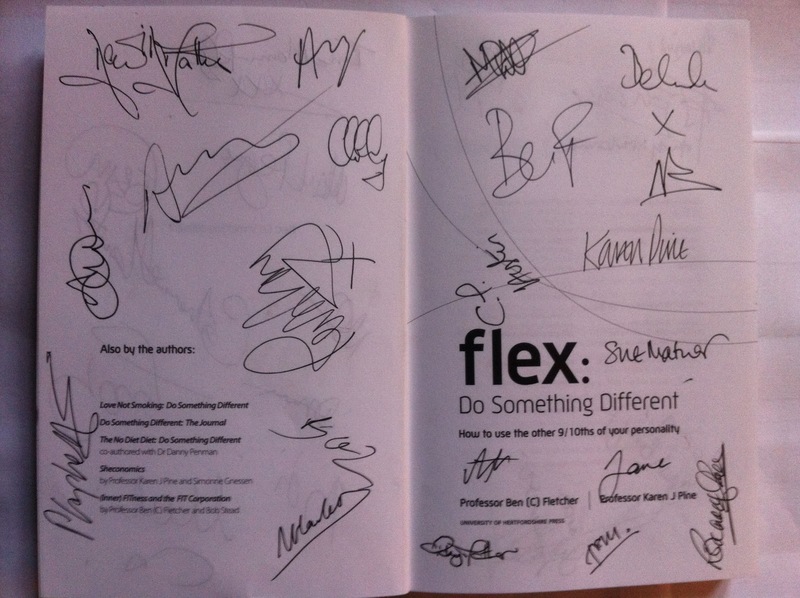 It was the launch of Flex: Do Something Different at the Groucho Club on Monday night. 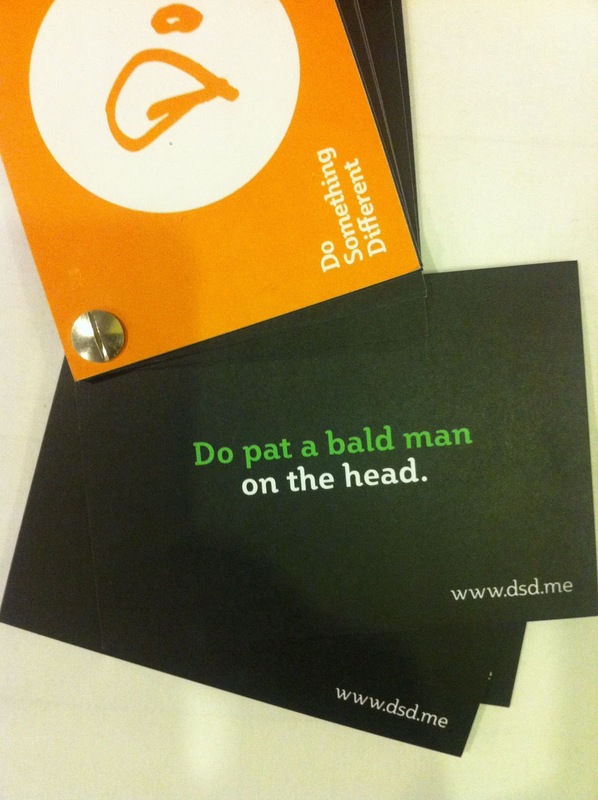 Everyone got into the spirit of Do Something Different. Armed with a pack of Do cards they left their inhibitions at the door, donned their rhyming badges, grabbed a glass of wine and went for it! Bald caps and black glasses (in homage to Ben Fletcher) were de rigeur for the Do team on the night. Rhyming badges made guessing people's names good fun (this is Neil above), even if Charlotte did get some funny looks on the tube going home. 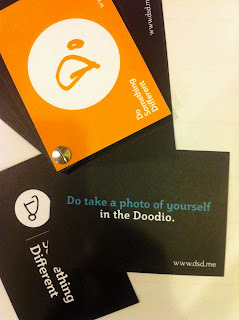 The Doodio was where people could go and take their own crazy photos. Weirdo expressions were optional. Do Something Different always seems to lead to people doing more for others. I love that. A beautiful demonstration of this came from a super guy called Mike Clark. 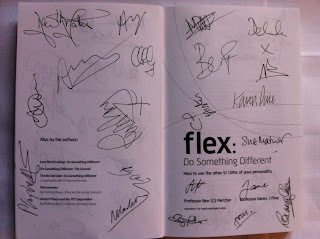 Mike bought a signed copy of our book, got everyone at the launch to sign it and then gave it back to Ben and I. What a fabulously karmic goosebumpy kind of gesture. That's why we're trying to get a million people to Do Something Different. It's behavioural change with a difference. It has to make the world a better place. 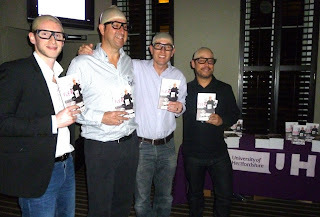 Our book launch in London tonight (16th Jan). How exciting! If all goes well I'll post some photos up here soon. If not, I'll just post some random pictures of very sensible people being well-behaved. SEE BELOW FOR HOW YOU CAN WIN A FREE COPY. Do Something Different. What a nice simple idea, someone commented recently. Yes, the idea IS simple. That’s what we like about it. But the science behind it is less than simple. In fact, it is based on over 30 years research. And now you can read about all the science behind do something different in the new book. Now you can experience for yourself the way we test people’s habit levels and their behavioural range. Be warned, it can be quite an eye-opener! These tests are used in our online programmes to design tailor-made Do’s for our Do-ers. 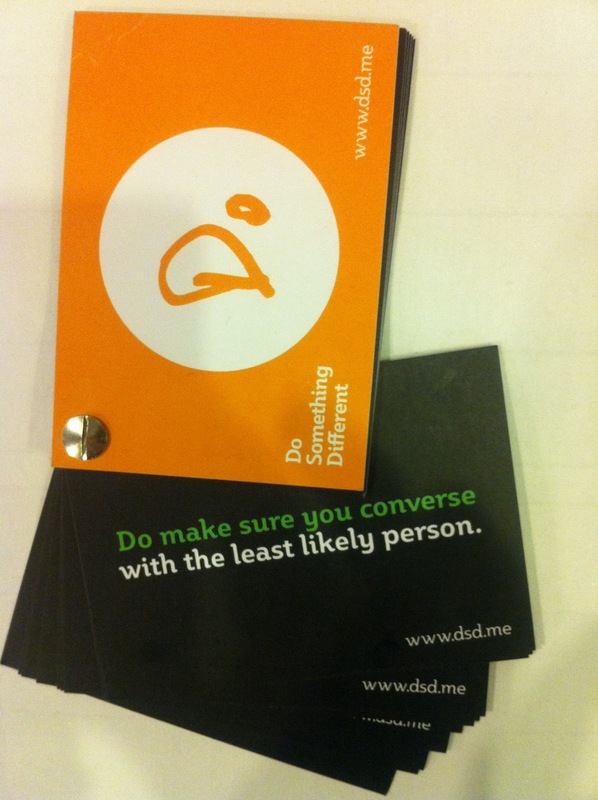 The Do’s, usually sent by text or email, start off simply. ‘Walk a different way to the shops’. ‘Listen to someone else’s music’. As people start to get the hang of it, the Do’s get more tailored to their own profile, spotting the gaps in their repertoire. Helping them to expand new areas of their personality. · Organise a night out at a karaoke bar, put your name down first. The emphasis is on expanding the range of behaviours people use, so they flex the behaviours that don’t come naturally. People find they can approach old problems in new ways, which can help to reduce stress. FLEX: Do Something Different. 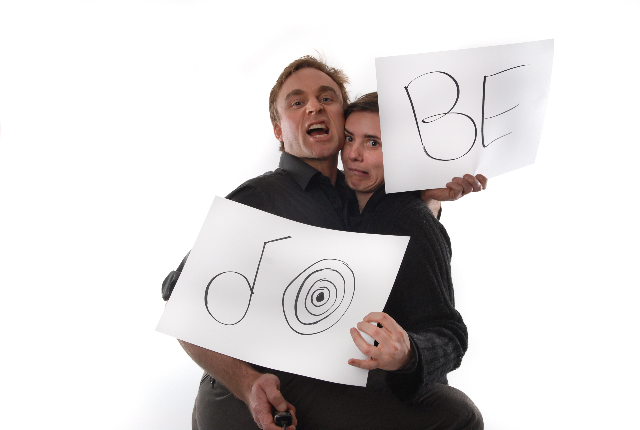 How to use the other 9/10ths of your personality, by psychologists Professor Ben (C) Fletcher and Professor Karen Pine, is published on 16th January 2012, by University of Hertfordshire Press and available from Amazon. What type of machine do the authors of Flex say people are? Email me (k.j.pine@dsd.me) and I'll pick five correct answers at random to receive a free signed copy of Flex: Do Something Different. When did you last do something different? Are you a human habit machine? wear the same outfit because it’s easy or comfortable? do something you said you'd give up doing? sit in the same spot to watch TV or eat a meal? visit the same holiday destination? recall negative things that people have said or done to you? watch a regularly scheduled TV programme? get bothered when people change plans at the last minute? If you answered YES to three or more of these statements then you are probably very habitual. Yes, habits are comfortable but they mean many of us end up using only about a tenth of our potential. The answer is to do something different. Why? Because it help improve a person's behavioural flexibility. And years of doing psychological research have convinced me that behavioural flexibility is the one critical asset we all need for a healthy and happy life. That's why Do Something Different runs through all the work I do. It's incredibly powerful, and it's fun and life-enhancing too. NOW - A NEW BOOK! I'm so excited because we've put all the science and the methods for Do Something Different into ONE FABULOUS NEW BOOK. 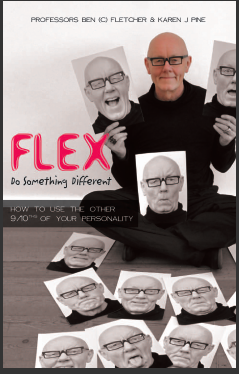 It's called Flex: Do Something Different, How to use the other 9/10ths of your personality. (Published by UH Press. See panel below right). 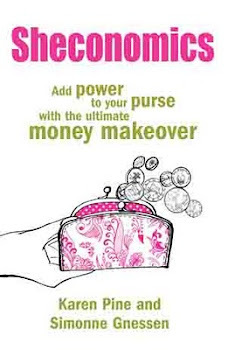 It's released on 16th January 2012 and is available from Amazon for pre-order. I hope you'll buy it, particularly if your habits need a good old shake-up! 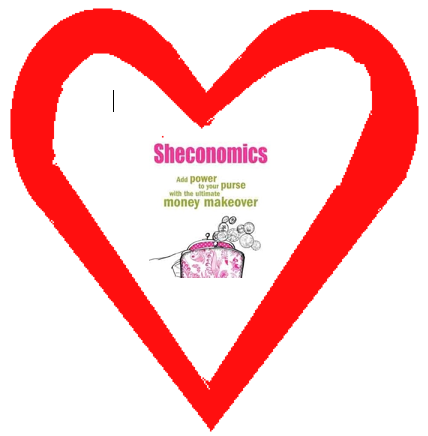 January 2012: Our publishers have assured us another print-run of Sheconomics is on the way soon. So if you're trying to order a copy, thank you for your patience. Out of 14 ratings, 13 people give it FIVE STARS. We're thrilled to bits that so many of you love Sheconomics and we thank you for your continued support. We plan to continue to bring you lots of up-to-the-minute tips for handling your money, comments on the latest issues, as well as some quirky psychology here. "The best non fiction book I have ever read. I have recommended it to all my friends and keep a very well worn copy in my hand bag . It helps me if I feel the urge to splurge on unnecessary things! Lol. On a more serious.note a truly inspirational and motivating book which everyone should read!" Don't forget to contact us via our website if there's anything else you'd like to see here, or if you'd like to receive our newsletter. And do let us know your thoughts on the blog by leaving us your comments. 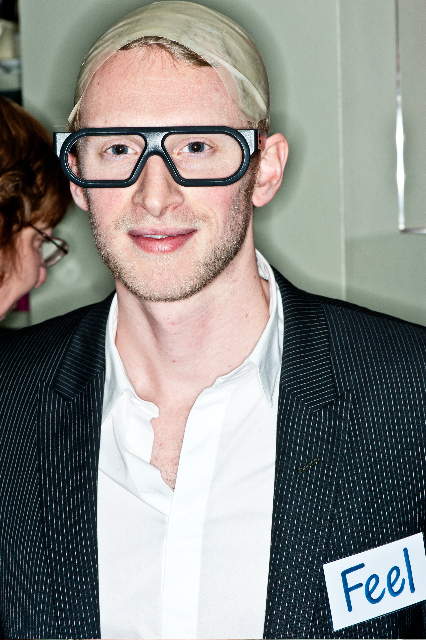 We look forward to hearing more from you in 2012.